The Best Rate for your Tuscan holiday? HERE where you are now, the official Hotel Boston website, THERE ARE NO INTERMEDIARIES (Booking.com and Expedia) to whom we need to pay EXTRA CHARGES for your bookings. For YOU, this means that as we have no additional costs, we can guarantee MORE FAVOURABLE RATES! Not convinced? Compare our prices with those of Booking.com and Expedia in real-time. Enter the details of your stay in the box above and click on “Check Availability”. 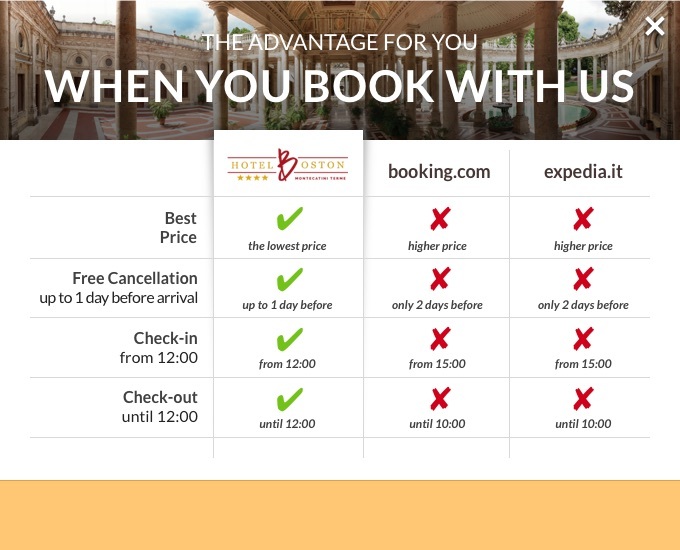 You will have proof immediately that we are telling the truth: see with your own eyes that the best rate can only be booked here!If you prefer, you can phone us on 0039 0572 70379 or send a request by writing HERE..
OK, but suppose I change my mind and want to CANCEL my booking? It is ALWAYS FREE OF CHARGE for all our flexible rate offers. NO RISKS: you can cancel or change your booking free of charge up to 1 day before the arrival date. You can cancel or change your booking FREE OF CHARGE up to 12.00 noon of the day before the arrival date. When you arrive (if it’s already ready), your room is available from 12.00 noon and on departure up to 12.00 noon (all others must arrive after 3.00 pm and leave by 10.30 am). We are always available to answer any question about your holiday in Tuscany or about the city Montecatini Terme. Unlimited Wi-Fi throughout your stay (both in your room and in all the facility). When you leave we can hold for free your luggage in deposit until the evening. For group bookings (more than 5 rooms) or bookings by Travel Agencies or T.O.? The prices and conditions that you find on this Official Website are exclusively reserved for individual Guests. For group bookings (more than 5 rooms) or bookings by Travel Agencies or T.O. Hotel Boston may change the rates or the conditions required. Residence tax? What costs does it have? Are children exempt? The city of Montecatini Terme requires payment of a Tourist Tax of € 1.40 per person per night, up to a maximum of 7 consecutive nights. Municipality residents and children under 10 years old are EXEMPT. The fee must be paid directly to the hotel upon arrival. Can the reservation be canceled or modified? How? The reservation can be canceled or changed at no cost until 12.00 a.m. the day prior to arrival. If you cancel or modify your booking after the above period you will be charged 100% of the cost of the first night for bookings up to 3 nights or 50% of the cost of the whole booking for longer stays. If you do not show-up or if you depart early we will charge 100% of the cost of the whole booking. Discover the discounts available for children and the additional services designed for them. A Child up to 6 years old stay free of charge if they share their parents’ bed. Upon request we have cots (camping beds) for € 15.00 per night. For older children we charge Triple Room rates.